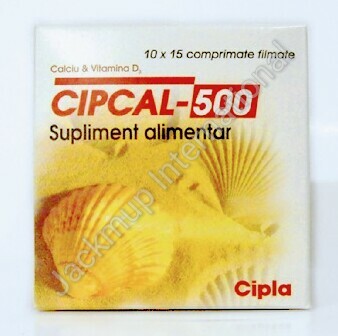 Description:- Cipcal-500 tablet has a balanced mix of elemental calcium and Vitamin D3. Calcium plays a very important role in the body. It is necessary for normal functioning of nerves, cells, muscle, and bone. If there is not enough calcium in the blood, then the body will take calcium from bones, thereby weakening bones.Thus intake of Calcium is necessary to keep the bones strong. Vitamin D helps the body absorb calcium and phosphorus. Having the right amounts of Vitamin D, Calcium, and Phosphorus is important for building and keeping strong bones. Cipcal is beneficial for pregnant women after 12weeks of pregnancy for bone formation and development of the baby. Cipcal-500 is also used in Osteoporosis and Postmenopausal phase Osteoporosis.